New Listing2018 Prizm Tevin Coleman Hyper Prizm Refractor RC Serial #'d 095/275! Up for sale us this very nice 2018 Prizm Tevin Coleman Hyper Prizm Refractor RC Serial #'d 095/275! 2015 National Treasures Colossal Black rookie card of Tevin Coleman. This card is serial number 15/25 made! Great card with a three color patch and on the card autograph. Lot of 2 Atlanta Falcons running back rookie patch autographs Includes: 2018 Panini Phoenix Ito Smith Jumbo RPA 55/149 2015 Donruss Signature Series Tevin Coleman rookie Patch Auto Items will be shipped in sleeves, top loaders, and bubble mailer. Please make payment within 72 hours of listing end. Card will securely ship within 48 hours and include an eBay provided tracking number. I combine shipping charges for up to (2) additional items at no charge so check out my other listings. I only accept Pay Pal and No International bidders please. Upon winning multiple listings, please request an invoice reflecting combine shipping. This card is very sharp/crisp and would be perfect for grading as it would do quite well if sent in. Card however is currently Not Graded not am I any type of grading expert. See pics for details and message me with any questions as I'm Ultra Responsive and love buying and selling cards! 5 stars is always my goal. Thanks for looking and Good Luck! Card will be sent in magnetic one touch pictured. 2015 Panini Prestige Tevin Coleman Rookies Signatures #289 Auto - FALCONS! 2015 PANINI PRESTIGE TEVIN COLEMAN ROOKIE AUTOGRAPH. You are looking at aTevin Coleman red paper parallel rookie card. This card is numbered 91 of only 199 made. 2015 Bowman Football. 2015 National Treasures Tevin Coleman RPA RC Rookie Auto 3-clr Patch /99-sealed! (TEVIN COLEMAN 2015 CLEAR GOLD ROOKIE AUTO. BGS PRISTINE 10 ! 10 AUTO )! EXCELLENCE . You are getting what is pictured. You are bidding/buying the card listed in the title and pictures. See scans! Shipping costs are $3.00 and includes sleeve, top loader, and padded bubble envelope. Max shipping only $3.00! Everything else will ship for FREE! Purchase as many as you like and request a total or wait for an invoice. Fast and secure shipping! Thanks for stopping by and be sure to check out my other auctions. Paypal is the only accepted form of payment. 14 day money back returns. FREE SHIPPING! Up for sale is the card pictured and listed in the description. All cards are at least in near-mint condition unless noted. All cards ship in top loaders and team bags. If you have any questions please ask before bidding! I only ship to United States addresses at this time. Please do not bid if you do not have a US address (COMC address is fine). Absolute Sports Cards, LLC ("ASC") Sincerely. However, ASC is owned and run by human beings who are not perfect. TEVIN COLEMAN 2015 PANINI NATIONAL TREASURES FOOTBALL. AUTHENTIC on-card AUTOGRAPH. BLACK PARALLEL. ROOKIE CARD #RSR-TC. 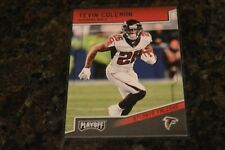 Tevin Coleman RB Falcons RC NM-MT NFL Original Non Graded. It will be by weight of the actual item. However, ASC is owned and run by human beings who are not perfect. 2018 Prizm Football Tevin Coleman Blue Die Cut Refractor 108/199 FREE SHIPPING. 2018 Prizm Football #192 Tevin Coleman Light Blue Die Cut Prizm Parallel Refractor Card. Card is limited to only 199 copies and is serialized #55/199. 2015 Topps Chrome TEVIN COLEMAN Camo Refractor /499 RC GMA 10 Gem Mint PSA? BGS? QTY AVAILABLE! Get it before it's gone!